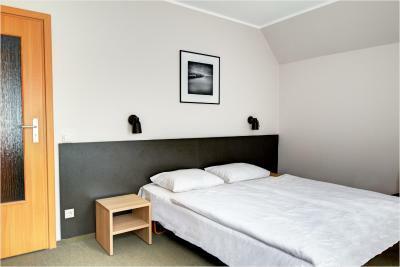 Lock in a great price for Hotel Jurate – rated 8.3 by recent guests! The staff was great, very friendly and helpful. View from the room was amazing too! Overall, the stay was great. Location, cleanliness of the property and courteous staff were a plus. Very good locatioj,right in the center of Nida. Bads is good. 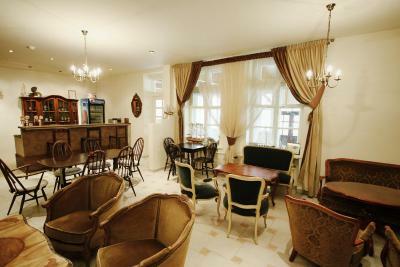 Good location, comfort room with beautiful view throught the window, friendly and helpful staff, private parking place. 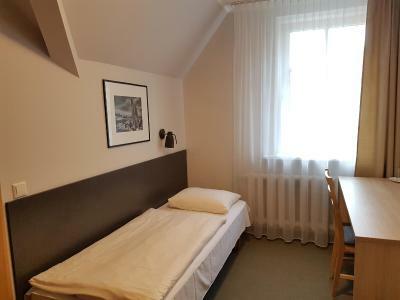 Decent enough economy room for a single person with twin bed, closet space and good-sized bathroom. Mini flat-screen TV had a few English channels and better TV reception than the more expensive Vila Banga across the street! Wifi also worked better than Vila Banga. Quiet room as well (I was in room 305). Hot shower water and pressure works well. The included breakfast is also pretty good: scrambled eggs and mini pancakes, various cold and some hot meats, assorted cheeses and bread and rolls, yogurt and cereal mixes and fruit juices. 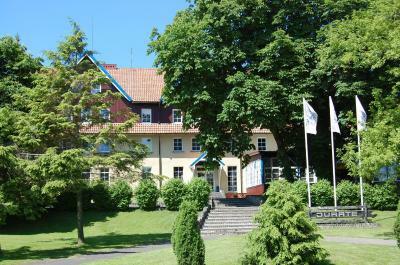 Beds comfortable, very clean room, pleasant views, nice receptionists who always offered freshly made coffee . Large big room and separate living room. The cafe/bakery near the hotel was very nice. Very central location, close to everything we needed. Only 150 feet away from the Curonian Lagoon, Hotel Jurate offers a hairdresser and a travel agency. 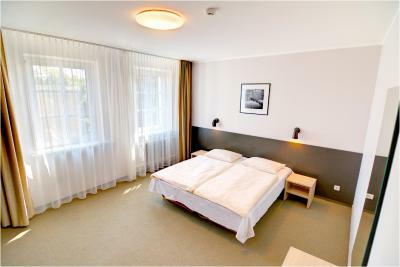 Its peaceful rooms look out to the surrounding gardens. 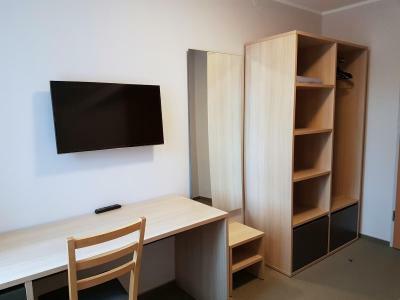 Rooms here are fitted with a work desk and a bathroom with a shower cabin. National dishes are served at the restaurant and breakfast is buffet style. Guests can also visit the souvenir shop located by the lobby. Wi-Fi is free in all public areas. 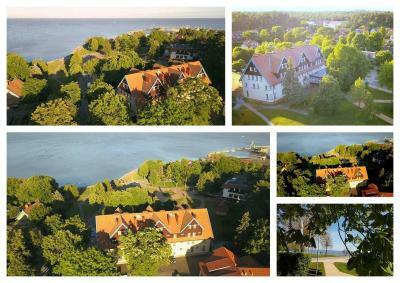 Bicycles can be rented directly at the Jurate and guests can explore the bike track from Nida to Smiltyine. This signed-posted track has a length of 32 mi and runs through the dunes forests. 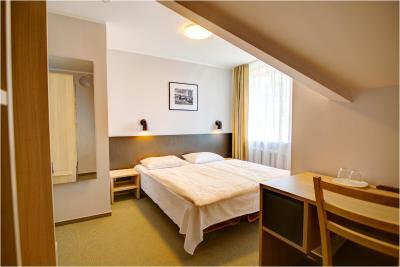 When would you like to stay at Hotel Jurate? Carpeted room with a bathroom. Includes a separate living room with a sofa bed. House Rules Hotel Jurate takes special requests – add in the next step! Hotel Jurate accepts these cards and reserves the right to temporarily hold an amount prior to arrival. The whole place is a bit worn down. It was dam cold in the room. Heating was probably turned on only before arrival. Price is too big for such room and such hotel. The room looks nice but hotel itself does not. Also there was no space for cosmetics in the bathroom. Breakfast was poor. Coffee was very bad. It was a nice and clean room in the town center. I wish there was air conditioning. It was extremely hot at times. For a 100 euros a night they should include such a basic amenity. Service was rather rude than friendly. No air conditioning, it was difficult to get a parking place. The interior design of the hotel is a bit outdated, breakfast could be better. No elevator option. 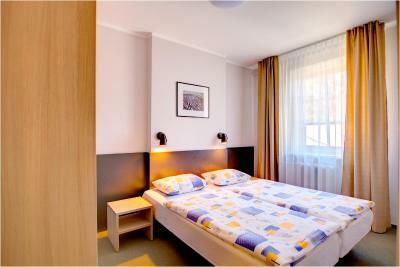 Rooms are clean and comfortable, a good location. Breakfast was fantastic and everything was comfortable. The bakery next door was amazing. Hotel Jurate is just great! Price is little too high for that kind of hotel. Otherwise no issues. 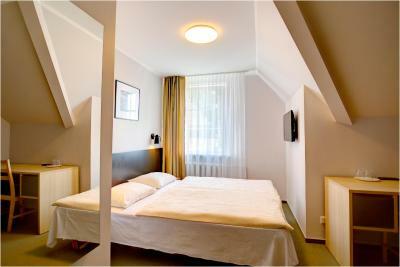 Hotel was recently refurbished so rooms are clean and comfortable. Breakfast is very much Soviet hotel style but still not bad. Location is excellent.